LOS ANGELES -- A suspected car thief has died after leading police on a chase that ended with a standoff when the man climbed a crane at the Port of Los Angeles, CBS Los Angeles reports. The man spent about three hours on the crane and eventually took off all his clothes, at around 8.p.m. During the standoff, the man was seen walking around, waving, twitching and even doing calisthenics on the narrow ledge of the crane. A SWAT team eventually approached the man and tried to coax him down to safety. At about 9:30 p.m., the man either fell or jumped to his death, landing on a ship, police said. The vehicle was stolen from a dealership in San Bernardino and the driver was was able to get onto the port property by blowing past a security checkpoint staffed by private security, police said. 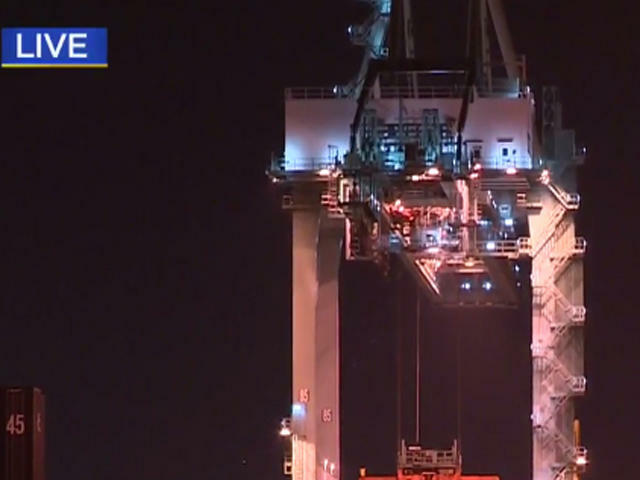 The man drove recklessly around the port before scaling the 17-story crane. The pursuit reached high speeds and got extremely dangerous. The driver nearly hit many vehicles and scraped the car along the shoulder of a freeway as he darted through rush-hour traffic.